We use the highest-quality supplies from Elite Crete Systems. 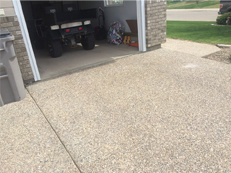 Has provided decorative concrete solutions in the Grande Prairie, Dawson Creek, Fort St. John and surrounding areas for the past 11 years. In the past 8 years we have expanded our business to include a new and innovative technique for raising sunken concrete with a polyurethane foam solution. The new green alternative to mudjacking. Miller Custom Concrete & Design is the first to bring this new technology to the Peace River region.